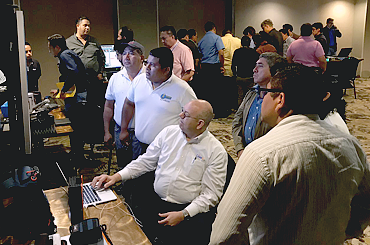 Continuing to popularize our products on the Latin American market, our colleagues at Broadcast Depot took part in Broadcast Show Guatemala and Broadcast Show El Salvador on February 26th and 28th respectively. Making the most of those opportunities to establish contact with potential local customers and also exchange ideas with fellow broadcasters, our trusted partners report positive feedback from these events, much to our delight. As usual, many thanks to Broadcast Depot for their reliable, competent representation and for their tireless work in bringing our equipment to such a wide audience. Broadcasters worldwide are already buzzing in anticipation of this year’s edition of the NAB show, which will be held April 6th through 11th in Las Vegas and promises to once again be quite a spectacle in terms of cutting-edge, innovative technology and impressive product displays. Maintaining a tradition stretching back for many years, DEVA will once again be involved as an exhibitor and we are simply thrilled at the opportunity to be a part of this massive event. Preparation for the show is well underway here and we can already reveal that, in addition to some familiar and proven gear, we will also be showcasing some recent releases and unveiling a brand new product that is sure to wow the demanding NAB crowd with some truly astonishing features. Introducing our DB4005 model for the first time, we are proud to be able to bring to the attention of show-goers a third-generation FM radio modulation analyzer and receiver with an MPX input and a number of other great characteristics. For the chance to get an exclusive look at this upcoming product and find out more about its capabilities, head to Booth N5916 (North Hall) where our team will be expecting you with all the information you need.